Whether yours is a new or established business, most businesses find it beneficial to offer business cards to some or all of their employees. There are many good reasons for equipping your employees with this valuable tool, after all exchanging business cards is the customary next step after meeting someone you'd like to stay in contact with. There are many cool new Smart Phone apps that can make quick work of business cards, scanning them and adding them to your local contact database, or those like Cardmunch that will load them directly to your LinkedIn profile. No matter how you choose to manage the information, it all starts with the business card. A business card empowers and validates your employees, who take pride in their jobs and company affiliations, as well as providing their contact information. It also represents and legitimizes your business. Designing and printing business cards that convey the image and personality of your company in the most positive light may seem like a simple task, but it can bring a great return. Do you already have a company name? If you're company is new, then you may not. Developing an appropriate name for your company in this case should be the first step to building your "entity" or image. For established businesses, this may not apply. Do you want a name that is unusual and will be remembered, like Purple Monkey Photo? Or do you want a name that says what your company does, like Acme Plumbing & Heating Company? Are you a limited liability company or incorporated? Do you want to add the abbreviations "LLC" or "Inc." on the card, in a formal way, or not? Depending on your budget, and your printer's capabilities, you may be limited in the number of characters per line, the number of lines, etc. Does your company have a brand, image or logo? If not, you can design your own, which is inexpensive. But if you don't have the expertise in designing such things, it may come out looking unprofessional or sloppy. If you have the budget, you can hire a graphic designer, advertising firm or printing company to handle branding, imaging and logo design for you. If you already have a brand, image or logo, do you want to incorporate these things on your business card? For example, a professional sports team, like the Arizona Cardinals, usually has established colors and a logo. Everything the team puts out in front of the public follows the color scheme and logo or branding rules. The more consistent the use of these rules, the more recognition it garners among the public. A company's color scheme and logo can be used in everything they put out to the public. Branding creates public recognition of your company. Once you have a logo, if you can afford it, and it is unique enough, having it trademarked to protect from infringement or imitators, is worth the investment. And then include it, as well as the colors on not just your business card, but your letterhead, envelopes and postcards too. Use your color scheme and logo on business cards. Use your color scheme and logo on business cards. If you do not already have a company Website, it is worth the investment. Once you have a Website for your company, you will want to include the URL, or Web address, on your business card. This allows potential clients to access that Website and have a more in-depth look at your business, products and/or services. Once you have the domain name, you can also set up email accounts so you can send and receive company email. There are many companies who design, build and host your website for you, so you don't have to spend too much time on it and can concentrate on running your own business. Besides websites and email addresses, the other points of contact for the public will be your phone numbers and fax numbers. If you have an office phone, you will want to put that down, so people can leave a message for you. If you are a start up company, out of the office a lot or saving money, you may want to use your cell phone as the main point of contact. There are companies that will handle your phone services for you, including providing a real-live person to take messages for you. If you are a start-up company, or self-employed business, you can use your home address or get a post office box, rather than spending precious financial resources on leasing an office. There are also business incubators that will allow a physical location, where office space is available on an as-needed basis, with a shared telephone operator. Now it is time to choose the materials for your cards. Do you want standard white paper and black ink, or higher quality paper stock and different colors? Do you want your cards printed on something other than paper? Standard size and shape, or something unusual? Your card's appearance says as much about you as the information printed on it. 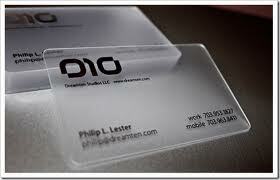 Business cards printed on plastic, wood or metal are memorable. Business cards printed on plastic, wood or metal are memorable. Once all of these elements are in place, the final step is to choose a printing company with whom to have your business cards printed. Depending on your budget, the choices range from printing them on your own computer to inexpensive and simple online ordering services to full-service printers. Before printing your business cards, check out other cards in your possession or online. Look at fonts, colors, logos and layout. If you are serious about your company's brand and image, have your business cards, along with letterhead and envelopes, designed by a professional. Make sure your business card makes a lasting statement. Feel free to CONTACT US with any questions or comments call us at (520) 571-1114.